Western Force will look at All Blacks' Ma'a Nonu and Cory Jane in a bid to replace their departing superstars. Richard Graham, Western Force head coach, will need to replace outgoing Wallaby star back James O'Connor, who will join the Melbourne Rebels, and David Smith, who is off to Top 14 Orange side Toulon. 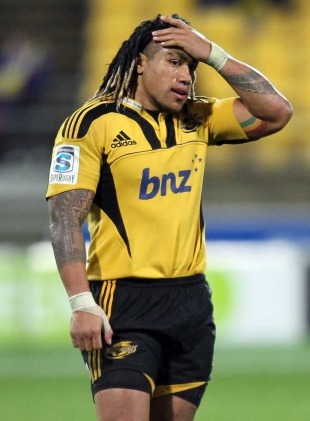 Bulldozing centre Nonu, who has 56 caps for New Zealand, has been informed by the Hurricanes that his services are no longer required and he looks set to be joined through the Wellington exit door by fellow All Black Cory Jane. Graham has admitted that he will run the rule over the two New Zealand internationals but he will also look elsewhere in a bid to replace his two stars. "With Wellington's news over the last few weeks that there's Nonu (and) Jane (available), I think everyone's interested in them," Graham told the AAP. "And whilst they're in the market, we will spend some time this week assessing those people and speaking to them if we think it's appropriate. "He (Nonu) is an international footballer. Any All Black, any Wallaby, any international footballer that's off contract, we'll look at. The rules are really simple in Australia. You can take one (international marquee) player. And so based on probably the best footballer and then the balance with the rest of your recruitment, (that) will determine who you recruit as your marquee. We are going to lose David Smith, so we are looking for an outside back, someone who can break the line with the same regularity that David can." Graham, who admitted he has already begun negotiations with some potential new arrivals, would not be drawn on O'Connor's recent comments concerning the deadline for his amended contract. "What we said last week is how it transpired," Graham said. "It's clear from what we said. I don't think we need to cover that ground again." Meanwhile, Force skipper Nathan Sharpe is confident his side can plug the gap left by the departing O'Connor. "James is a fantastic player in his own right but, with that gap that he creates, someone will step up and fill that and bring different qualities to the team," Sharpe said.